A24 have released a haunting new trailer for Claire Denis' upcoming science fiction film High Life, starring Robert Pattinson, Juliette Binoche, André Benjamin and Mia Goth. In the French auteur's English-language debut, Denis depicts hopeless death-row inmates who have been chosen as scientific guinea pigs for scientist Juliette Binoche. And as they hurtle toward oblivion, Pattinson plays a father struggling to keep his daughter safe. 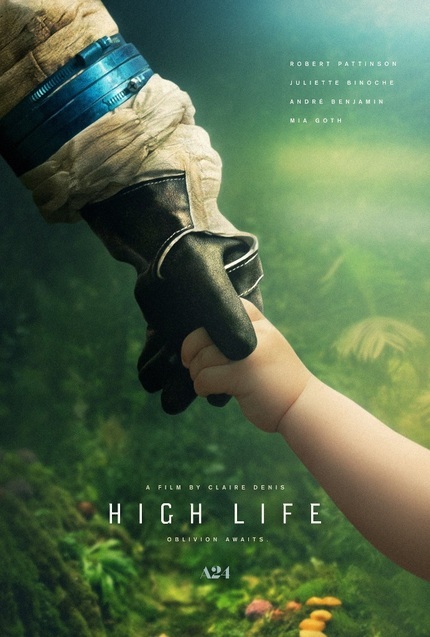 No stranger to critical division, High Life was met with an equal share of praise and criticism upon its premier at the Toronto International Film Festival last year. ScreenAnarchy's Shelagh Rowan-Legg reviewed the film favorably from TIFF, which gives me hope it will be as thought provoking and challenging as some other foreign art house space station thrillers like Marc Caro's Dante 01 or Ivan Engler's Cargo.